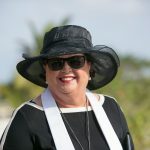 Last week I was out of town as my dad is ill, but Rev Harold Paramlall substituted admirably for this cruise wedding. 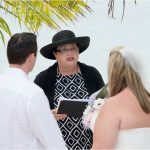 Peggy Moorhead, our wedding co-ordinator did a fantastic job as usual, so I think this Reston, Virginia couple were happy with their Cayman Islands wedding. 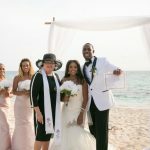 The wedding was somewhat unusual, since the bridal couple were on a cruise, and their guests came as stay-over visitors to attend the wedding. 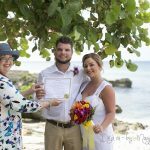 The wedding took place at Governor's Beach around 10 am in the morning. Pretty girls all in a row! Surrounded by the people they love!